Natural products have long been regarded as ‘nature’s medicine chest’ providing a rich source of lead compounds as invaluable platforms for developing front-line drugs. Our research focuses on making and modifying naturally occurring bioactive compounds that have been isolated from plants, animal tissue, microbes or marine and soil organisms, which are rare or hard to isolate in abundance. These compounds provide rich and diverse chemical structures that challenge the synthetic chemist to develop new flexible synthetic methodology for their construction. The preparation of synthetic analogues of the natural compound may improve the biological activity and provide an understanding of the mechanism of action of the naturally occurring compound. The following is a representative list of our research projects. Many of our research projects are not listed and we encourage you to contact us should you have further query. Synthesis of spiroketals and spiroketal-containing natural products is a longstanding interest of our group. These molecular scaffolds, consisting of two (or sometimes even three) rings joined at a quaternary carbon with two bonds to oxygen, are found in a wide range of natural products that demonstrate interesting bioactivity. Some examples of our current and previous targets are shown (spiroketals highlighted in grey). The discovery and development of new reactions offers opportunities to improve synthetic routes to important materials, readily and selectively access previously challenging structures and improve our fundamental understanding of chemical processes. Recently, our group uncovered an unexpected reaction to form alpha,beta-unsaturated vinyl amides directly from esters. Our investigations revealed that the reaction likely involves an unusual [3+2] cylcloaddition of an ester or aldehyde enolate, with in situ generated vinyl azide, a little-used reagent with an intriguing history dating back to original work in 1910. We are keenly pursuing the possibilities opened up by this new reactivity; for rapid access to previously hard-to-access vinyl amides (versatile synthetic intermediates and useful industrial polymer feedstocks) and synthesis based on them; to explore the mechanistic basis of their reactivity through experiment and calculation (e.g. transition state TS1); and finally to assess the potential of vinyl azide itself in organic synthesis. 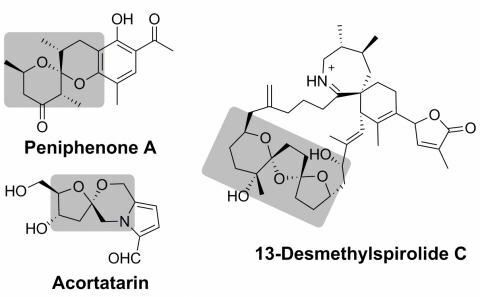 Shellfish toxins produced by dinoflagellates in during algal blooms such as portimine and gymnodimine are a significant risk to human health – but also provide a stern challenge for existing synthetic methods, and inspirational leads for medicinal chemistry and drug development. Portimine exhibits promising selective anti-cancer activity and apoptosis induction, and gymnodimine is an extremely selective ligand for the nicotinic acetylcholine receptors important in nerve signal transduction. Our group has a strong ongoing interest in the total synthesis of these complex and highly bioactive molecules, and revealing their potential use in medicinal chemistry through structure-activity studies. Telomerase inhibitors are of much current interest as a selective approach for the control of human cancer. The rubromycins (inset) are a unique class of antibiotics produced from a strain of Streptomyces that have been shown to inhibit human telomerase. We have previously completed the synthesis of rubromycin, and are currently interested in novel catalytic methods for asymmetric synthesis of this unusual class of compound, that possess a single chiral centre at the spiroketal position. We will investigate the asymmetric synthesis of benzannulated spiroketals using chiral Lewis acid catalysis, using a new route to prepare the necessary cyclisation substrates only recently identified in our group. 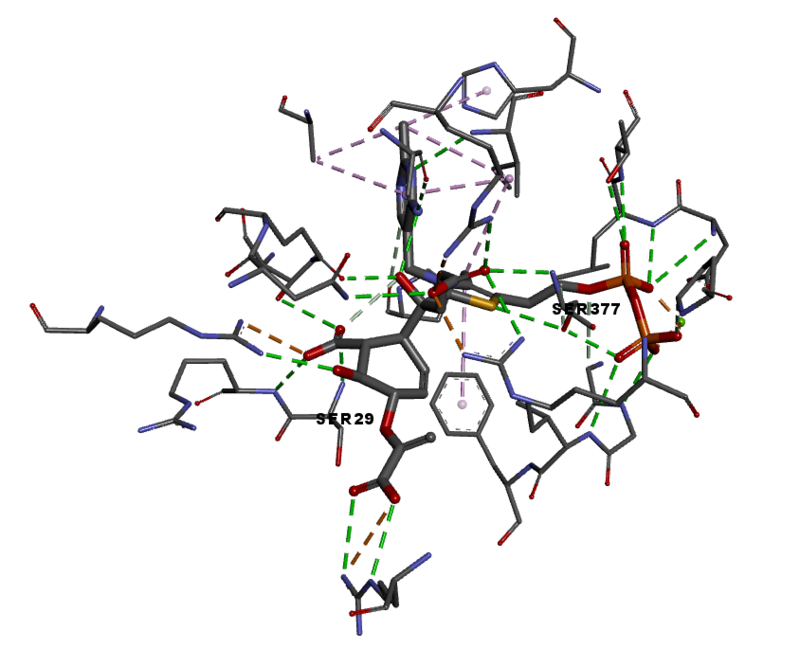 In addition to probing the properties and stereochemistry of the compound class, we aim to develop new practical synthetic routes in order to assess the biological activity of chiral lead structures based on rubromycin. Callyspongiolide is a 14-membered macrolide isolated in 2013 from an Indonesian marine sponge of the genus Callyspongia Sponges of this genus are known to produce a diverse variety of bioactive secondary metabolites, including polyketides, polyacetylenes, alkaloids and cyclic peptides, but to date, callyspongiolide is the only reported macrolide. Callyspongiolide was found to exhibit potent cytotoxicity against a range of cell lines (L5178Y mouse lymphoma IC50 320 nM, human Jurkat J16 T lymphocytes 70 nM, Ramos B lymphocytes 60 nM). Interestingly, addition of a caspase inhibitor (QVD-OPh) did not attenuate the activity of callyspongiolide, suggesting that it promotes cell death through a caspase independent mechanism. The relative configuration of the C5, 7, 9 and 12 chiral centres was determined using a combination of 1D NMR proton coupling constants and transannular correlations in the 2D ROESY spectrum. Due to the extremely hindered nature of the secondary alcohol at C21, however, it did not prove possible to prepare any Mosher ester derivatives. As a result, the absolute stereochemistry of callyspongiolide, and the configuration at C21, has not been assigned to date. The C14-19 yn-diene side chain linking the macrolide and bromoaryl domains is unprecedented in macrolide natural products reported to date, although known polyacetylenic algal metabolites are legion. Total synthesis of the callyspongiolide will enable the complete structural elucidation of the natural product to be completed and permit convenient access to the key sub-structures for SAR investigation of the important biological activity observed. Tuberculosis (TB) currently affects tens of millions globally and imposes a significant economic and health burden, especially in developing countries. The menaquinone (vitamin K) biosynthetic pathway offers a new drug development target, as control of menaquinone levels can affect the survival of the causative bacterium Mycobacterium tuberculosis in hypoxic environments. (+)‑Isochorismate is the substrate for the first committed step in menaquinone biosynthesis, catalysed by the enzyme MenD. We are investigating the MenD-catalysed reaction of isochorismate, and its potential as a druggable target in TB. The study draws together complementary expertise in asymmetric synthesis and compound library preparation for SAR study (SCS), alongside structural biology and enzyme kinetics (SBS).